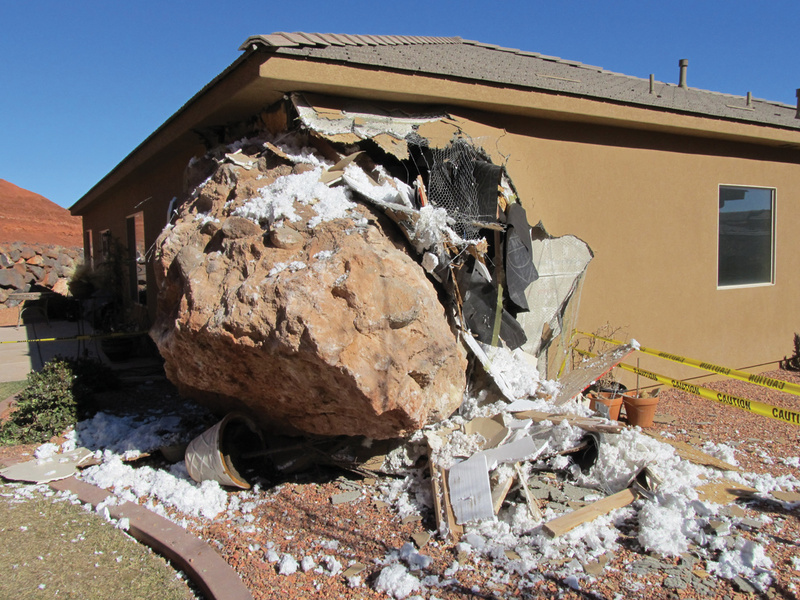 2013 St. George rockfall that damaged a residence and severely injured the occupant of the home. Photo credit William Lund, January 2013. 1 Three fatalities are classified as from a landslide and a dam and water conveyance structure failure. 2 Debris flows are both a landslide and flooding hazard. 3 Limited data is available and contains various assumptions; exact number of fatalities is unknown. A variety of geologic hazards in Utah adversely affect life safety, health, property, and the state’s economy. Although limited information exists on the direct and indirect costs of geologic hazards in Utah, the 1983 Thistle landslide alone resulted in direct costs of $200 million (1983 dollars), and the Utah Department of Transportation estimates that repairs to Utah State Highway 14 from a major landslide in 2011 cost between $13 and $15 million. 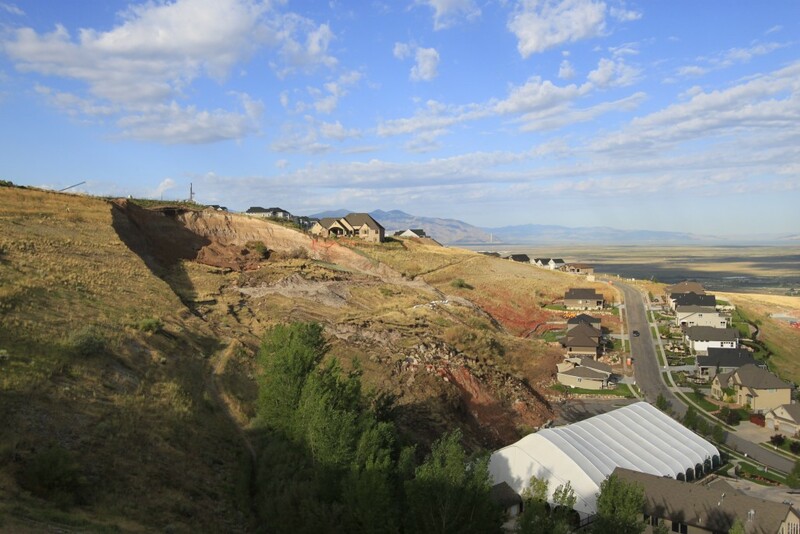 The 2014 Parkway Drive landslide in North Salt Lake severely damaged a house and tennis and swim club, and threatened other houses and nearby regional natural gas pipelines; final remediation costs are expected to approach $2 million. Great Salt Lake flooding in 1983–1984 caused over $240 million in damage. Since 1847, approximately 5797 fatalities, and a significantly higher number of injuries, from geologic hazards have been documented in Utah. Radon gas exposure (a known cause of lung cancer) has been Utah’s most deadly geologic hazard with over 5372 fatalities (data only available from 1973–2012), followed by landslide hazards with 337 documented fatalities, and then flooding hazards with 101 documented fatalities. Fortunately, not all geologic hazards are life threatening; however, when not recognized and accommodated in project planning and design, all geologic hazards may result in significant additional construction or maintenance costs. To protect Utah’s citizens from geologic hazards, the Utah Geological Survey (UGS) has long recommended that a comprehensive engineering-geology investigation be performed for all development to provide information on site geologic conditions, the type and severity of any geologic hazards present, and to recommend solutions to mitigate the effects of the hazards, both at the time of construction and over the life of the development. To facilitate conducting the recommended engineering-geology investigations, the UGS has published guidelines for investigating geologic hazards and preparing engineering-geology reports that provide minimum techniques, standards, and report content to ensure adequate geologic site investigations to protect public health, safety, and welfare. Additionally, the UGS has urged the adoption of geologic-hazard ordinances at the municipal and county level, and provided school-specific guidelines to the Utah State Office of Education for engineering-geology evaluations of new public school buildings. Recognizing that some of these guidelines are now nearly 30 years old, and that the state-of-engineering-geology practice is continually evolving, the UGS decided in 2015 to update its guidelines. Additionally, two other geologic hazards, rockfall (see photo) and land subsidence and earth fissures related to groundwater mining, have become sufficiently damaging over the past decade that the UGS has developed new guidelines for investigating and reporting on those hazards as well. All of the updated guidelines, along with the two new guidelines, are now combined into a single publication for ease of use and to facilitate updates and additions to the guidelines in the future. The publication provides guidelines for conducting engineering-geology investigations and preparing engineering-geology reports (Chapter 2), surface-fault-rupture investigations (Chapter 3), landslide investigations (Chapter 4), debris-flow investigations (Chapter 5), land-subsidence and earth-fissure investigations (Chapter 6), rockfall investigations (Chapter 7), implementing geologic-hazard ordinances (Chapter 8), and preparing and reviewing engineering-geology reports for school sites (Chapter 9). The updated guidelines are currently in review and are expected to be published mid 2016. As the UGS develops additional geologic-hazard-investigation guidelines in the future (snow avalanche-hazard guidelines are expected in late 2016), this publication will be updated as necessary. Users should refer to the UGS web page, Recommended Geologic-Hazard Report Guidelines, for the most current information and guidelines.